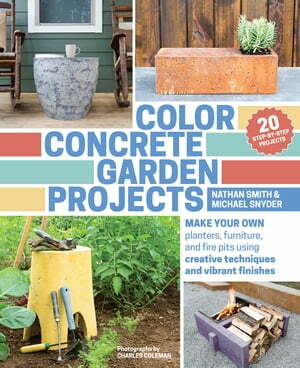 Collins Booksellers - Color Concrete Garden Projects by Nathan Smith & Michael Snyder, 9781604697322. Buy this book online. Incorporating concrete design into a home garden can now be easily achieved by any do-it-yourself enthusiast! Concrete furniture and containers add style and personality to outdoor spaces, and the addition of color makes these objects even more eye-catching. These trendy pieces can cost thousands of dollars at garden centers and furniture stores, but they can also be made affordably at home. In this hands-on guide, concrete artisans Nathan Smith and Michael Snyder offer basic information on how to mix concrete and add color using dyes, paints, and inlaid materials. The twenty step-by-step projects include small items, like a candle holder with an old-world feel and a simple stacked-ring planter, and larger pieces, like an elegant bike rack and a beautiful fire pit that is the perfect gathering place for friends and family.